SUMMARY: For 2018, Rawlings has embraced the USA Bat standard by developing one of the most unique and innovative youth baseball bats ever created. The 2018 Rawlings Quatro USA Baseball youth bat displays a wide variety of technological advances that are sure to empower hitters. The Quatro features Rawlings’s exclusive 100% carbon fiber composite and Tru View Technology which provides maximum pop upon the baseball. The 2 5/8 barrel utilizes an extended construction with a lightweight end cap allowing for longer plate coverage, reduced swing weight, and faster swing speeds. The Rawlings’s Quatro also encompasses a unique 4 piece construction called the VDT (Vibration Dampening Technology) or Quatro Collar which features Focused Flex. This newly developed fusing of technologies houses a silicone collar which significantly decreases shock vibration and enhances power potential thereby dramatically building confidence and empowerment within youth baseball players. The 2018 Rawlings Quatro USA Youth Baseball Bat is perfect for contact hitters looking to increase pop and speed simultaneously. OUR REVIEW: As one of the premiere global manufacturers of youth baseball equipment, Rawlings has become a trusted brand for youth bats, gloves, apparel, and miscellaneous sporting good accessories. With the new USA bat standard changing the youth baseball game, Rawlings has set out to produce a line of new 2018 USA youth bats that will deliver performance and comfortability. Despite this promise from Rawlings, our staff entered the evaluation of the 2018 Rawlings Quatro skeptical of it being a leading USA bat for the 2018 season. Much to our surprise, the Rawlings Quatro not only provided superior all-around performance, it also received some of the highest scores of all the 2018 youth USA bats we have evaluated. 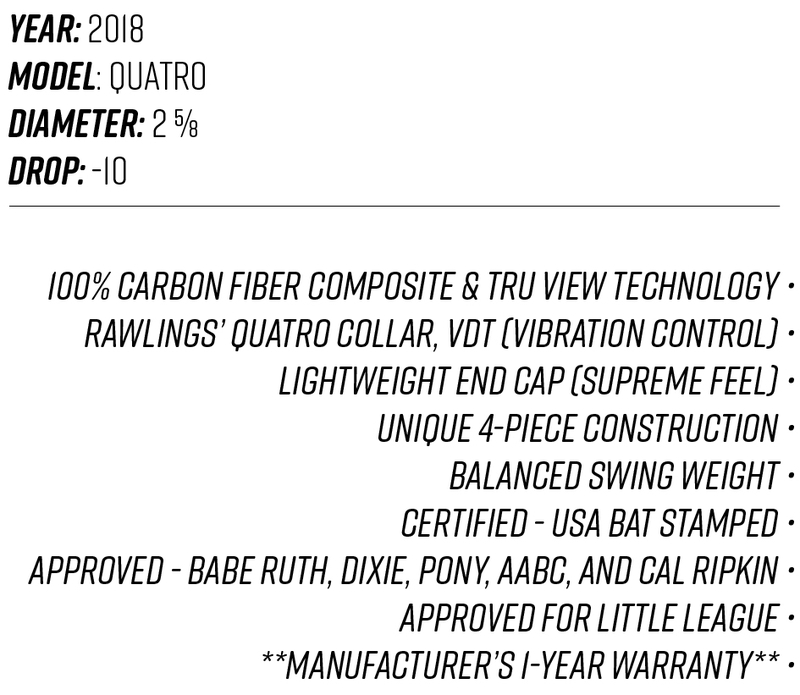 After over 300 solid swings, below is our official review of the 2018 Rawlings Quatro USA youth bat -10 drop. POP: Those familiar with the USA bat standard know that this change brings about a new line of bats that limit the potential for power when compared to bats abiding by the USSSA bat performance standard. By performing at “wood-like” levels, anticipate USA bats to produce slightly less pop than youth baseball bats from past years. During the pop portion of our evaluation, the Quatro provided more long distance solid shots (line-drives of 60 feet or longer) than most other 2018 USA bats. One of our volunteer youth hitters said, “the Quatro bat I just tested out is the only Rawlings bat I have ever used. I consider myself an Easton baseball bat hitter. I was set to buy a Ghost X for the new season, but after swinging the Quatro, I am making a switch.” From our staff’s observations and recorded data, The Quatro delivered significant pop especially for being a youth USA bat with decreased pop potential. VIBRATION CONTROL: Our analysis of the shock vibration control of the Quatro comes directly from the feedback of our youth volunteer hitters. Much to our surprise, the Quatro scored the highest in shock protection according to the scorecards. Out of all the individual ball players who tested out the Rawlings Quatro, less than 5% reported a lingering stinging upon the hands. No other USA bat provided this level of comfort. GRIP & COMFORT: When creating the Quatro, Rawlings incorporated a multitude of technological and innovative features specifically aimed at optimizing the level of comfort, balance, and speed all in one youth bat which simultaneously wouldn’t need to compensate with a decrease in pop. Much like the previous category, the evaluation portion measuring “Grip & Comfort” comes straight from the feedback of our volunteer youth hitters. One particular youth hitter said the following, “The Quatro was very balanced, lightweight, and easy to swing. It felt a lot like swinging a traditional lightweight alloy bat. I really felt comfortable using it.” Not only did this youth USA bat score well with our hitters, but our staff noticed a consistency in balanced, level, and quick swings from every hitter who tested out the Quatro youth bat. DURABILITY: Our staff was very satisfied with the durability of the Quatro. We documented over 300 solid swings with impactful collisions upon the baseball only to find minimal damage. The youth bat incurred some expected handling scratches and scuffs on the barrel, however no major damage occurred (cracks, dents or dings). OVERALL EXPERIENCE: Of all the 2018 USA bats we have evaluated thus far, none has surprised our staff more than the Rawlings Quatro. Honestly, we didn’t place high expectations on Rawlings delivering a youth USA bat that would contend with the likes of premiere bat manufactures like Easton or Louisville Slugger. In our opinion, the Rawlings Quatro is one of the best USA bats currently up for purchase and worth every penny. It doesn't matter if your child hits for power or contact, it doesn't matter matter if your child has an abundance of baseball experience or not: The 2018 Rawlings Quatro features enough technological breakthroughs to enhance to hitting experience of any youth baseball player.